What are the advantages of BKL mounting systems? Does BKL manufacture peep sites? Does BKL manufacture scope mounts for centerfire firearms? Does BKL manufacture a higher or lower mount? How tall are BKL mounts and risers? Does BKL make Weaver-style mounts? Does BKL make mounts for 30mm scope tubes? Does BKL have a custom shop? Will BKL scope mounts fit my rifle's grooved receiver? Will BKL scope mounts fit 11mm (European Receivers) and 3/8" dovetails? Will rings of other manufacturers fit BKL adapters and risers? What is the recommended torque applied to the base screws? I have to center BKL scope mounts? Will BKL scope mounts stay zeroed if I remove the mount and install it again? How do I know when the scope tube is properly clamped? Do BKL scope mounts require lapping? 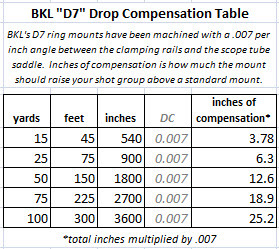 Does BKL make drop-compensated mounts? I have a drop-compensated BKL mount. Can you tell me which direction to install it? How do I determine if I need Low, Medium or High rings for my Scope/Rifle combo? Do BKL scope rings feature a Stop Pin? What are the advantages of BKL mounting systems?? #1 Installation is performed easily because there are few components to contend with. BKL uses the same #8-32 screws for both scope ring and base clamps. One 9/64 hex wrench tightens all. #2 The inside diameter where the rings clamp together is radiused to prevent scope damage. #3 Our clamping system self aligns as it tightens down on 3/8â€� and 11mm dovetails. #4 No lapping required. No, but our sister company AirForce Airguns does. Some models of our 1" rings and mounts (200 Series) are available in High versions and dovetail to dovetail risers are also available. From the bottom of the foot to the base of a scope tube our 200 Series mounts are .774" tall for regular height or .974" tall for high versions, and our 300 Series mounts are .989" tall. BKL Risers will add .67" to the mounting height. No. However we do make Weaver-style adapters. Please refer to our 500 Series product page. Yes. Please refer to our 300 Series product page. All grooved receivers are either 3/8" or 11mm and BKL scope mounts are designed to fit both. Yes. Each BKL scope mount clamping system will fit both 11mm and 3/8" receivers. Our recommendation is 35 in/lbs. If there is a problem with clamping after this much pressure has been applied then please contact us. Do I have to center BKL scope mounts? No. All of our products center up as the pressure from the clamping system pulls down as it clamps in. No. However you can maintain a high level of repeatability by keeping the scope tube attached to the scope mount and loosening the base clamp just enough to slide the setup off of the receiver. This will usually keep adjustment down to one or two clicks. When the oval shape of the ring becomes a circle around the scope tube and no gap is seen between inside diameter of the ring and the outside diameter of the scope tube. Important: Do not close the gap between the edges of the ring (the flat surfaces where the screws are) as this might crush your scope tube! Please refer to our technical data sheet for more information. No. All BKL mounts are designed to eliminate the need for lapping. Stress relief slots in the base clamp and the thickness of the top clamps allow the mount to form around the scope tube rather than distort its roundness and alignment. Yes. Please refer to our 200 Series for products BKL-254D7 and BKL-260D7 that are drop-compensated. Earlier system: the stamped part of the mount (with the D7) goes towards the front of the gun. Newer system: dots on the bottom of the mount indicate the front of the gun. What is the formula to figure out how much a drop-compensated mount will raise my shot group at varying distances?